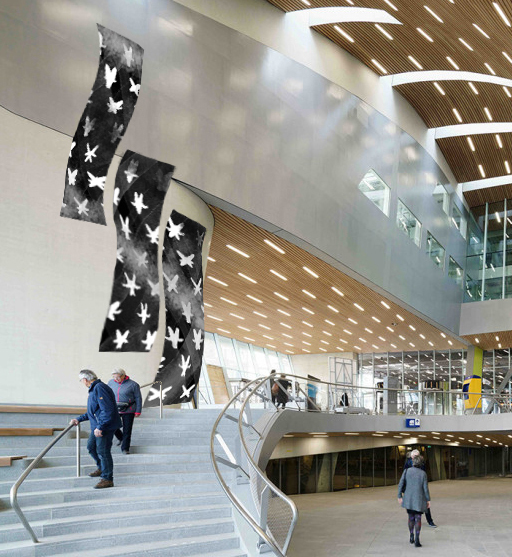 The Evolving Wallpaper is a set of unfurled rolls of digital wallpaper undulating in waves down the walls of a space. Each of the motifs in this ethereal wallpaper appears related to the decorative motifs from the Victorian era â€“ a time when decorative art designers and evolutionary biologists were in dialogue about all they knew and suspected about pattern and variations on a theme in the natural world. Unlike a normal wallpaper pattern in which the same motifs repeat again and again, in this wallpaper the motifs are each individuals, much as we are each distinct variations in the theme of humanity. On the these interactive digital sheets, the motifs pulse lightly, disintegrate as they age, rearrange in the pattern, and respond with behaviors at a viewerâ€™s touch. The touch of a viewer favors a motif so that, as in nature, the most favored motifs leave their progeny to the next generation, and thus the look of the population changes over time. Remarkably expressive, the Evolving Wallpaperâ€™s patterns at once evoke both a grandmotherâ€™s wallpaper and the skittering creatures of the Burgess Shale. Over the course of weeks, months, and even years the wallpaper motif population evolves in response to the people who frequent or pass through the space where the wallpaper lives. Multiple sites nationally have invited installations of these wallpapers, and each wallpaper population will likely evolve differently in response to the different groups of people at each site. As in life, migrants can even pass via the cloud from the population in one site to the population in another. A later meta-exhibition will compare the evolved wallpapers of multiple sites. It took five years to write biologically sound genetics for a wallpaper. In early 2013 I and my scientist colleagues at the University of Pittsburgh discovered that the genetics I painstakingly wrote are likely robust enough to do experimentation in the field of population biology, thus opening the possibility that this work can contribute new perspective to both the world of art and the field of evolutionary biology. Already the development of this work has received funding from the National Science Foundation, an arts grant from the Pittsburgh Foundation and The Heinz Endowments, and has been written about in the journal Science. The Evolving Wallpaper grew from a four-year collaboration between myself, and evolutionary biologist Stephen Tonsor. Our practices were mirrors of one another in two different fieldsâ€”we were motivated in conceptually similar ways: How do we understand pattern and chaos, ideal and particular, damage and decay in the life of beauty and complexity, and things that are powerful, intricate and also fleeting? From that shared conceptual space I became interested in finding a single work that could stand in both our fields, though I surmised its conceptual life would be entirely distinct in each. It was from that goal that the Evolving Wallpaper emerged. For me the great question is about this workâ€™s double life as a work of art and a system of scientific experimentation: Will these two lives synergize? Or be a seeming contradiction? Or a greater-than-the-sum of their single stories? Simply crafting them to live together in the same body has already been an enlightening trail. This image and those above are development screen shots of geneic clones produced by the wallpaper. Note how there are subtle differences among individuals just as would occur among naturally occuring clones, such as twins.